This adventure will surely stir the wanderlust in you! Be prepared to explore one of the islands of the Philippines in a different way. Visit unusual sites that are not commonly offered in the regular tours. If you want to be out by the sea every day and you have a taste for adventure, then this tour is definitely for you! Be prepared to dive, camp and have an awesome time with us while discovering the culture and history of the place. This adventure package also includes staying at Palawan Sand Castles, Tribal Adventures’ basecamp for adventure in Northern Busuanga – the jump off point for dugong spotting trips, wildlife safaris, mountain biking, and hiking trips into the wild of Busuanga. Welcome to Manila! You will be picked up by our representative to take you to your hotel. You'll stay for a night to rest from your international flight before embarking into a great adventure for the next 8 days. On the way to your hotel you will be doing a quick stop to visit one of Manila’s historical spots; Luneta and Intramuros. Enjoy! It's get up and go time. Today you will be travelling to Coron which is the starting point of this 12-day adventure. You will be brought to Clark International Airport which is a 2 -3 hour ride from Manila for your flight to Coron. Upon arrival in Coron, you will be picked up by your hotel’s transport service. Get settled in your hotel and you have the rest of the day to rest or explore the town of Coron. We will pick you up from your hotel in Coron Town. Today we have an island hopping tour, visiting Calumbuyan Island and Dicalatan Island. We will camp out at Dicalatan Island for the night. There is an opportunity for snorkelling at Lusong Shipwreck and East Tangat Reef. Snorkelling in Punta Dinamita and Crowning Glory Reefs. Check-in at Hotel Maya in Culion. We will visit the Culion Museum and Archives, and there is the opportunity to take part in the Culion Historical Walk Tour. Island hopping between on Kalanggaman, Malcapuya, Banana and Bulog Dos Island. 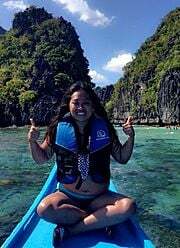 Coron Island tour! (Kayangan Lake, Twin Lagoons, Barracuda Lake, Banol Beach). We take the trip back to Coron town to check into the hotel and rest. Free Day! Feel free to roam around and explore the city of Coron or party the night away in local bars and pubs. One of our representatives will pick you up in Coron town and transfer to Palawan Sand Castles to check-in at your choice of accommodation. You can choose between relaxing and watching the sunset, or taking sea kayaks and snorkels to explore Dugong Bay. Choose a Tribal Adventures day trip that leaves from Palawan Sand Castles. You have the choice between: full day of dugong (manatee) spotting, a wildlife encounter at Calauit wildlife sanctuary, a mountain bike day trip through the single tracks of Coron, or a hike and bike day trip through the tropical rainforest in Northern Busuanga. On a mountain bike, explore the community around Sand Castles and meet some of the locals (Tagbanwa Tribe), getting an insight into local life. In the afternoon you will be heading back to Coron Town. Use this extra day to relax in the hotel. You can book a massage service for a much needed relaxation and pampering session after all the adventure of the last few days! Or rent out a motorbike to go around and explore the town. Upon arrival at the airport, one of our representatives will pick you up and take you to your hotel. Enjoy the last day in Manila by going around the Eastwood CityWalk complex to shop for souvenirs, or simply enjoy the world class amenities of your hotel. Unfortunately, all good things must come to an end. This morning marks the end of your adventure. You will be brought to the airport for your flight back to your home country along with precious new memories and unforgettable adventures.